Fans of Kristen Stewart (The Runaways) will love the Blu-ray for Snow White and the Huntsman, and not just because she stars in the movie. According to almost all the special features, Stewart is the most amazing person to ever walk the Earth. The actress is gushed about constantly on the disc, reminding us that the fantasy movie will probably go down in history as the film that broke up Stewart’s four-year relationship with Twilight co-star Robert Pattinson (after Stewart cheated with her Snow White director Rupert Sanders). But Snow White and the Huntsman should be remembered for its stunning visuals, inventive twist on the fairy tale and a rich, standout performance by action star Chris Hemsworth (Thor) as the Huntsman. Sanders’ first foray into directing feature films, after making a name for himself in commercials, Snow White and the Huntsman is beautiful to watch. The sweeping landscapes, the gothic architecture, the colorful Sanctuary and the brilliant Mirror are gorgeous eye candy. 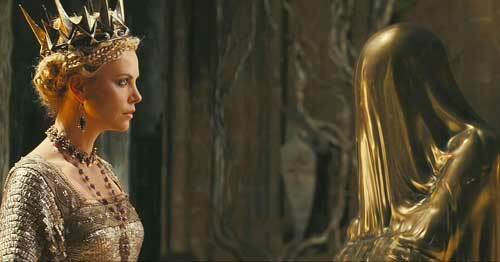 And the story, with its evil queen (Charlize Theron, Young Adult) who learned as a child that beauty is the only way a woman has power, provides a deeper and more thought-provoking take of the old fairy tale than other movies, for example, say, this year’s other Snow White spinoff Mirror Mirror. On the high-definition Blu-ray, Hunstman‘s scenery and great sound effects are all the more immersive, especially showing off the red blood on the snow (which was Sander’s real blood, he admits in his commentary), the shimmering gold of the Mirror and the slicing of swords in many a battle. So, it’s a shame that when it comes to the special features, it’s as if everyone took a Kristen is Wonderful pill. In almost every featurette, Sanders exclaims how talented, amazing, you name it, Stewart is. And even Hemsworth and Theron are pulled into the game, although I suspect their inclusions are mostly from editing choices by the disc’s producers. The making-of featurette “Reinventing the Fairy Tale” again espouses about how amazing Stewart is with a little about what the screenwriters were going for when they wrote the script. I’d have preferred more of the latter. There’s a slight change of pace with the featurette “A New Legend is Born,” which doesn’t talk about the new story legend, like you might think, but about how amazing and revolutionary and … you get the point, Sanders is. Now, sure Snow White and the Huntsman is a good film, but when someone’s brilliance is thrust down my throat, I begin to wonder why I have to be told. Shouldn’t I be able to see it for myself in the work? More about his take on this fairy tale would have been better. The featurette does show some really nice storyboard pictures, though. The best featurette of the bunch is “The Magic of Snow White and the Huntsman,” about the movie’s visual effects, which really do deserve high praise. It’s especially fun to see the inspiration behind the design for the troll, one of the highlights of the film. In the commentary, we’re back to the Stewart Fan Club. Sanders praises her plenty, even commenting about her wonderful performance when she was walking through the stinking sewer. I think SAG would have been on the studio if the water really was a sewer. In some places the kudos are just laughable, like when visual effects supervisor Cedric Nicolas-Troyan says, “Kristen looks so great when she runs.” Really? When they’re not espousing the gift that is Stewart, Sanders and Nicolas-Troyan (who are also joined by co-editor Neil Smith, but he remains quieter than the other two) mostly tell us what is happening on the screen and in the story. For example, “This is a massive chaotic night scene with fires burning and people being slain,” Sanders says. No kidding. We can see that. The Blu-ray comes with both the version of the movie that played in theaters and an extended edition that’s only four minutes longer. The additions are barely noticeable, making me wonder why they bothered. There’s also a nifty picture-in-picture feature and 360-degree tours of five sets, where you can click on various parts to view more interviews or more 360-degree tours. But all in all, the special features aren’t anything to write home about. You might want to stick with the movie.